what a great place. enjoy the American flag too. nice looking windows and 'points' in the architecture. A very beautiful, graceful bell tower and appreciate the New England interpretation of gothic arched windows. This church looks like it has been around of a while. Ooops! I also meant to say that I love your header. What a cast of characters! All yours? Spectacular! What a lovely old church! Love it! 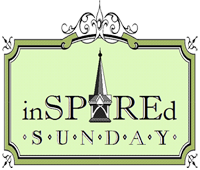 Thanks for sharing it in InSPIREd Sunday. Sorry I am so late visiting this week.